I promised a bigger project than pens for my next post… Then I tore my Achilles Tendon playing Rugby. Now, two weeks after surgery I can’t lift or balance much heavier than a pen. First is Manzanita Burl and Cocobolo capped with Turquoise Tru-Stone and brass fittings. I thought it would be a difficult turn, but the manzanita was so hard that there wasn’t much difference in textures. Just don’t get the stone too thin at the “nib” end or it will crack when you try and assemble the pen. Second is a Desert Ironwood Burl with my “Molten Copper” acrylic blank (one of first attempts with a homemade pressure pot assembly) and finished with a 22kt gold kit. All in all I am pretty pleased with them, but I need some new design ideas. I think next will be some homemade hybrid Burl blanks… just worried about any moisture from the Burl being released into the acrylic and making cloudy air pockets.I’ve seen some bad results with epoxy jobs that didn’t have a proper seal coat. If anyone reading has experience in this area, I’d love to hear your thoughts. those are some sweet looking pens,love your combo of materials very nice.when i saw the last pic i thought maybe you dropped one of those hefty pens on your foot-lol.great job woz. Beautiful pens. I really like the kits. If you don’t mind me asking, who makes them? @ BuiltinBkyn, I order all of my kits from woodturningz.com. They have a good selection and are the only people I have found who will ship CA glue and friction polish internationally (as strange as that sounds). 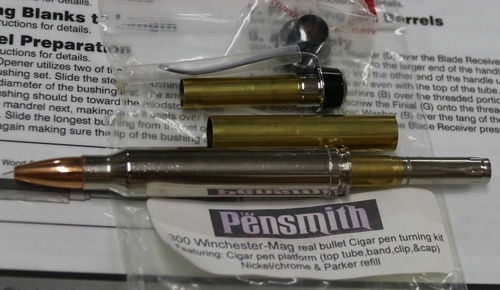 Plus the cigar kits are only about $4.50 a piece compared to about $6 on other sites. when i was making pens i used them as my go to supplier.as woz said they have good prices. Great looking pens T’Woz and like the way you have combined materials. Agree with pottzy that that gummy leg could have easily been caused by a pen dropage. Personally I love the cigars because they are naturally a lager pen and find that distortion of their normal dimensions could prove a tad cumbersome. However, having said that some people love a big hunk in their hand and you have done a great job on them! chased them down and as you’re into cigars and if interested in guns they’re available from here.